Powder-based exfoliants seem to have really come into the limelight over the past year or so. I think part of the appeal must be how customisable they are, plus it's kind of fun to feel like a bit of a scientist in your own bathroom too! The basic idea is to simply mix the powder with a few drops of water to transform it into a face scrub, but the best part is you can tailor them to your own needs by mixing with other things like hydrosols, serums, or even yoghurt or honey. Needless to say I was intrigued by the trend so decided to give a couple a try for myself! S.W. Basics are known for their simplistic approach to skincare, using as few ingredients as possible. Their Exfoliant only contains organic oat flour, organic almond flour and sea salt - talk about simplicity! I know you're thinking it sounds like it belongs in the kitchen rather than your beauty stash, but each ingredient has their own skincare properties! 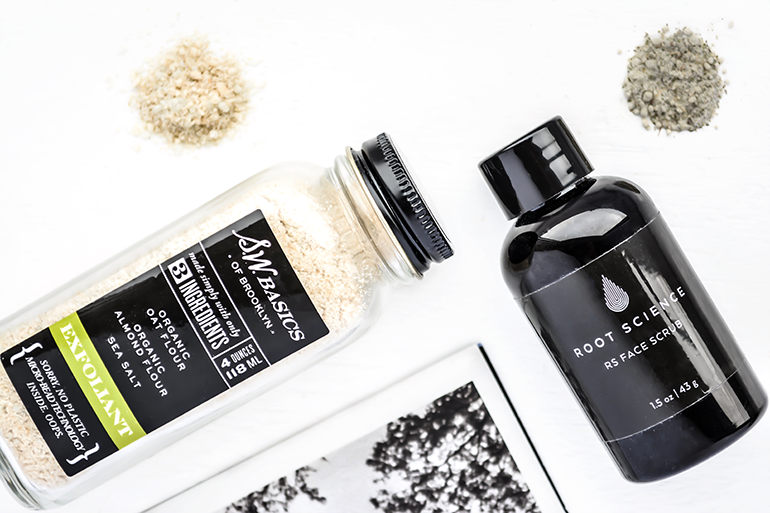 Oats are often recommended to soothe and soften irritated skin, almond flour is perfect for gentle exfoliation with nourishing effects, and sea salt has a high mineral content and is said to help balance skin. Root Science are a US-based skincare company with a strong focus on organic ingredients and formulas with healing properties. I first heard about the brand through a Petit Vour box* back when they were still shipping to the UK, so unfortunately I don't think the brand is available over here at the moment. The RS Face Scrub is said to be suitable for all skin types and aims to exfoliate, draw out impurities and even skin tone. It contains a slightly more diverse blend of sodium bicarbonate, almond, spearmint & peppermint leaf, kaolin clay, arrowroot, bentonite clay, orange peel, neem leaf, slippery elm, marshmallow root and vanilla bean. The powder is grey in colour with a slightly minty, earthy scent and turns green when mixed with a few drops of water, although I actually prefer to use this one with an oil or serum instead so it's more hydrating. The particles are so small it doesn't even feel like a scrub at all, but still manages to gently exfoliate. I find that this scrub can sometimes leave my cheeks a little red, so focussing on just on my nose and t-zone works much better for me. After rinsing off, my skin looks slightly brighter with noticeably tightened pores and feels incredibly clean. Since I'm a huge fan of exfoliating balm cleansers, I'm not sure if I'm completely sold on exfoliating powders just yet! I know some people might swear by them... personally I just can't see myself using a powder-based exfoliant on a regular basis, although I think it'll be nice to keep one in the skincare stash for occasional use! What do you think of exfoliating powders? Have you tried any before? I'd love to try Root Science! I've most recently used up my travel size of the One Love Organics Brand New Day and loved it. I've been meaning to try the OLO scrub, will have to get a travel size soon! Great post! I've been using a powder exfoliant for about a year now. I am obsessed with the Strawberry Rhubarb Dermafoliant from Eminence Organics. So lovely and great to add to any cleanser/mask! The Root Science one sounds really nice, xoxo! Great post and I love feeling like a chemist in my own bathroom and really personalizing a mask/scrub. Great comparison! I also got the Root Science product in my Petit Vour box. I have yet to try it, but I see a few brands making these types of products. I'm actually excited to try mine now. I'm due for a mask this week anyways, so here's to it!